Truck traffic heading north on I-5 south of Albany. (File photo from April 2015). If you spend much time on I-5, you’ll be interested in this: ODOT engineers are recommending that Oregon raise the freeway speed limit for trucks from 55 to 60 mph, but they expect this would increase actual truck speeds only a little if at all. The state transportation department spent the winter and spring studying truck speed limits on freeway segments where there’s a difference between those and the speed limits for cars. That includes most of Interstate 5 in western Oregon. On Thursday, June 8, the state’s Speed Zone Review Panel will meet in Salem to consider the final report of an engineering investigation and decide what to recommend to the Oregon Transportation Commission. In the report, the state traffic/roadway engineer recommends raising the truck limit to 60 mph on all the freeway segments where the limit now is 55 mph for trucks and 65 mph for cars. One exception: In Roseburg, the report recommends keeping the limit at 55 for trucks and lowering it to 60 mph for cars, the same as on other urban segments of I-5. The ODOT engineers found that trucks already travel at an average speed near 60 mph, and that 85 percent of trucks go 64 mph or less. Says the report: “Numerous studies have found that establishing speed limits at a point between the average speeds and the 85 percentile speeds has resulted in the lowest crash rates.” The 85th percentile is the speed at or below which 85 percent of vehicles travel. Even though the difference between current truck and car speed limits is 10 mph, the actual difference on the road is only 2-3 mph in average speeds and 4-5 mph in 85 percentile speeds, according to the report. Raising the truck speed limit to more accurately reflect the fact that trucks are already violating posted limits is the Poster Child for situational ethics. What else is to be expected in the Trump era. WTF does trump have to do with having safer and less congested roads. leave it to a moron to take a good thing and make it look like a bad thing and then blame it on someone that has nothing to do with it. I did not blame Trump for anything. If you’d bothered reading my comment after taking off your Trump-colored glasses, you’d know this. You see! Even Kopczynski has been co-opted, aiding and abetting America’s slouch toward Gomorrah. I am so very tired of folks justifying speeding by claiming one is impeding traffic by going the limit. This claim leads to self-rightous folks rationalizing severely dangeours tail gating of others. This practice dramatically increases the risk of accidents, not those who obey the speed limit. I travel to Portland about once a week now. We went yesterday afternoon and came back in the evening. Both ways, there were many, many folks with tailgating in both the middle and left lanes, with not even a second space between them and the other cars. When will the police start handing out tickets for this behavior on a regular basis. I tend to drive in the middle and right lanes, so as not to impede traffic. But when I am doing 69 or so in the middle lane, am passing cars in the right lane, and get tail gated, I have little sympathy for the impeding traffic argument. Share the road safely folks. What a nonsense statement Ray. I don’t know what the Oregon State Police budget is, but I do know that Albany and Linn County definitely do support their police, fire fighters, and schools. The Linn County Sheriff bond was passed. The police and fire station bond was passed. The 8J school bond just passed. If you believethat there should be more police on the state highways, you may be right, However, I see police pulling folks over literally every single trip I make to Portland. I see them on the roads, with their radar guns. All I am suggesting is that they could also cite people for travelling too closely. However, would love to hear from an OSP officer on this blog. Perhaps they do so already, and we just don’t hear about it. In my life I have known many folks cited for speeding, but have never heard of one pulled over for tailgating. I expect it does happen, but I belive it should be as strongly enforced as the speed limit. The vehicles on the roads today are far more capable of the paltry speeds ODOT posts, as Oregon is one of of the few which have raised their freeway speeds. Cannot say as much for some of the drivers, but this has more to do with the driver education system here in Oregon. With the growing number of cars spending much of their time in crawling traffic, raising the speeds outside urban areas help keep the average speeds higher overall and movement of all these vehicles to their destination in a more timely manner. A little buffer of 5 or so more mph offsets any passing trucks or slow off-ramp/on-ramp speeds which lower the overall average speed and cause clustering, far more dangerous than speeding to begin with. Nobody is going to ‘moving violation hell’ for holding the average speed for which they are comfortable driving. Even OSP has noted the speeds average over 70 mph on Oregon freeways. Time for Oregon to get with it and bump these speeds up legitimately. In this age of smart technology we have signs that can display whatever speed limit is most appropriate given current conditions. Why isn’t Oregon using them? These signs can use available information to determine the most appropriate speed limit. Imagine an I-5 where the speed limit goes up to 85 MPH when the weather is good with few drivers on the road. Or drops to 55 MPH on Friday nights between midnight and 3 AM when the drunks are coming out of the bars. State panels, a state commission, and a state transportation department are needless bureaucracies when it comes to speed limits. It’s time for Oregon to move into the modern age. We don’t have such signs as they are a lot more expensive, and would be wasteful. We all know that truckers speed up to the “limit” plus whatever they think the troopers will allow above it – usually about seven mph. So raising the limit to 60 means they will be right up there with those suckers who drive cars and try to obey the law. Pathetic. 55 should mean 55. And, likewise, 65 should mean 65. Our concept of what the law means has gone down the toilet just like many other values in this “modren” society. 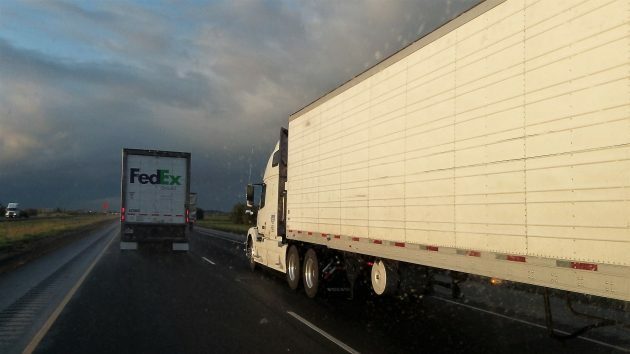 One big reason that people complain about so many trucks on the road is that the state wants them to pass all of them. When we get off on a state route where there is one speed limit for everyone it is amazing how many trucks disappear. It is really dumb to have half of the traffic moving at a different speed from the other half.